Alexander Dovzhenko is one of the great visionaries of the 20th Century. Later this month, Mr. Bongo will be releasing his celebrated War Trilogy, which comprises three major works: Zvenigora, Arsenal and Earth. Together these films chronicle the transformation of Dovzhenko's native Ukraine from a pastoral feudal society to an industrialized communist state. Dovzhenko's unconventional vision and experimental style remained rooted in his love for his native Ukraine, and its culture and its people, Zvenigora (1928), his first major film; is also his most joyous work, telling the story of an old man (Nikolai Nademsky) who guards the treasures of Ukraine buried for centuries beneath Mt. Zvenigora. Sergei Eisentein called it "A memorable event in the development of the cinema." Arsenal (1929) chronicles a group of World War I veterans, whose leader (Semyon Svashenko) is fired by dreams of Communist utopia, to foment revolution in Ukraine. The film's depiction of war is surreal, brutal and unflinching in its vision of the impact of modern warfare on a landscape rich in centuries' of tradition. It was described by the New York Times as "A visual poem filled with exquiste, haunting images of the years leading up to the great revolution." Earth (1930) builds on the earlier films, featuring the same actors in similar roles (Nikolai Nademsky as old man, Semyon Svashenko as firebrand revolutionary) to tell a poetic story of generations. The film's visual beauty and the intensity of its editing has made it one of the most influential films ever made, an inspiration for artists around the world and a regular fixture in international top ten film lists. Radio Times said of the film, "Combining lyrical beauty with simple truth, this is a masterpiece with a soul." 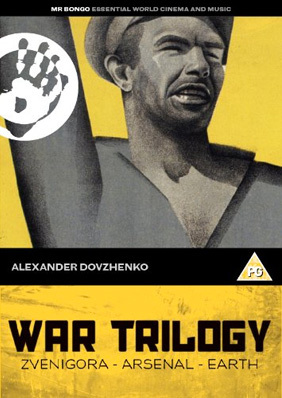 The Alexander Dovzhenko War Trilogy will be released on UK DVD on 24th September by Mr. Bongo Films at the RRP of £19.99. No extra features have been detailed.